Political parties are eccentric to electoral politics, which is indispensable to a multi-party democratic country like India. Political parties are no lesser than a driving force for electoral democracy. There is multitude of political parties in India, with different ideological hues competing for the throne of power. 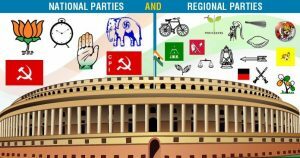 Political parties in India generally classified into national or regional party with pan India and state outlook respectively. The BJP and the Congress are the only two parties with pan India presence; of it, the Congress is the oldest political party, which traces its genesis in the Indian independence movement. Each political party has its own ideological plank, which distinct one party from another. In practice, the ideological distinction fades in the electoral politics and gets redefined according to the electoral convenience of the party. The regional political parties are known to collude with any national political party with the objectives to share power at the centre. Nationally the voters in India have experienced only two major political coalitions, named United Progressive Alliance (UPA) and National Democratic Alliance (NDA) led by Congress and BJP respectively. The phenomena of coalition grew only after the imposition of the national emergency by congress in 1975. Until then electoral fight has always been unipolar, where congress emerged winners only with the formation of Janata Party, a party formed by the cohesive opposition to take on the Congress. Alliances can be pre poll or post poll, according to the electoral arithmetic of the parties, but the lust for power or the challenge for survival is what compels the party to cobble as an alliance. The illustration of this is practiced in the state of Bihar, where sworn opponents congregated along with another rival to hold themselves from going into oblivion. The queer instance of electoral fray experimented by the Communist and the Congress in the recent state election, who acted as friend in West Bengal and foe in Kerala in a peculiarity of electoral convenience. The regional aspiration for greater integration has also obliged two parties with opposite doctrine to cobble coalition in the volatile state of J & K.
Although coalitions had been formed at the national arena in the name of National Front and United Front but it hadn’t borne any imprint on Indian politics as these had the association of Congress with it. 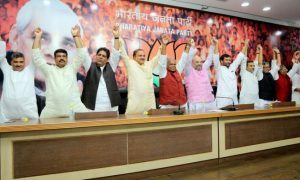 The first successful non-congress government that too a coalition, to last full term is credited to BJP led NDA under the seasoned PM AB Vajpayee, who had 24 political parties under the coalition umbrella of NDA. The same political component of the NDA had also effected the formation of Congress-led UPA after the general election of 2004 and 2009. Politics is a fixture of convenience where the foe remains disguised as friends and the ideological melee is just the smokescreen.